I have had it with seeing pet people driving around putting themselves, their beloved pet (mostly dogs) and other drivers at serious risk by placing their pet in their lap between them and the steering wheel! Or, maybe their pet is riding in the passenger seat, looking out the window, with or without a harness. It might be cute to see, but the pet is in a perilous situation. Would You Allow Your Child Or Grandchild To Ride With You Like This? My guess is, probably not. I don't recall seeing a baby being held between a driver and the steering wheel or a child riding in the front seat without wearing a safety belt. We are much more concerned about our child or grandchild's safety than just trying to avoid getting a traffic ticket. I remember when we didn't have to wear a seat belt and it took me a while to get used to wearing one. Now, I can't imagine NOT wearing my seat belt! Note, the driver in the above photo is wearing his seat belt, but what do you think would happen to his sweet dog if an accident occurred which caused the driver's airbag to deploy? 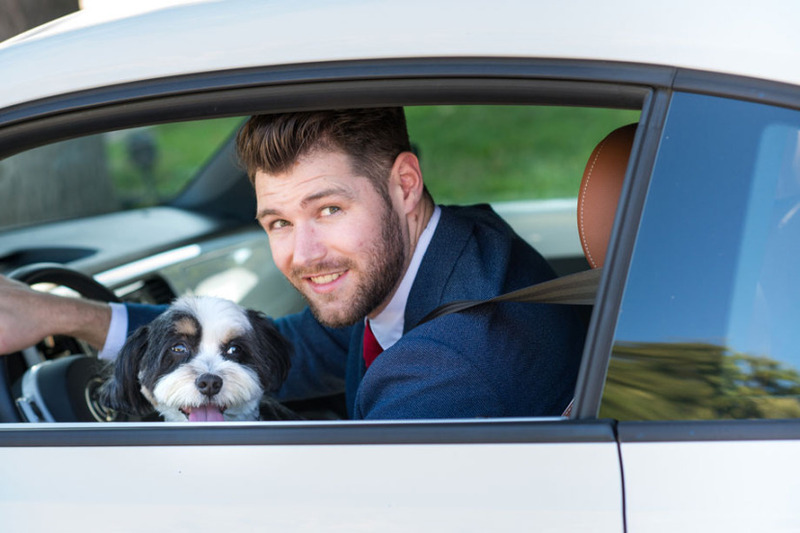 How much attention can the driver really give to his driving having to deal with a dog in his lap? Whether you are taking your pet with you on vacation, a trip to the vet, the dog park or a friend's house, it is extremely important to consider his/her safety as much as yours. How safe is this cat if there were a passenger-side collision? Or, any crash, for that matter. 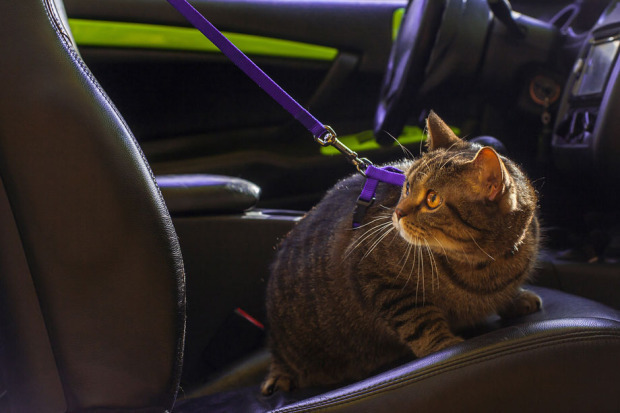 The cat's harness might help, but it also could be a serious problem in the event of an accident. Since an accident is unexpected and happens so quickly, it is traumatic to us and we may or may not even notice that our cat may have escaped, be very confused and possibly be seriously injured. So, why don't we provide safe transportation for our beloved pets? Like everything else, it is about education. Some states are actually doing something to protect our pets while riding in a car. Hawaii's distracted-driving laws now prohibit drivers from holding a pet in their lap while driving. In New Jersey, a NJSPCA officer can stop a driver and issue a ticket from $250 to $1,000 per offense for improperly transporting an animal. While it may not be illegal in some states to drive with an unrestrained pet, it certainly is dangerous. Think about it: People over about 7 years old traveling in a car must be wearing a seat belt and younger children must be in an approved car seat, properly installed and belted in. It is what we do to protect us and our family. We must provide the same measure of safety to our 4-footed family members! I am a big proponent of using hard sided pet carriers (one pet per carrier) and having it safely secured with a seat belt, preferably in the back seat and away from the airbags. If an accident happens, your pet will be much more likely to survive in a hard-sided pet carrier than in a soft one. And, if your pet has his/her own "accident" while traveling, it is a lot easier to clean up the carrier than your car's seat. Please read my follow-up blog later this month about carrier training (mostly for cats) and where to store your pet carrier - it might surprise you! Meow for now.